An organization internationally recognized as a terrorist organization, an organization which took over the Gaza strip in a very violent coup in 2007, an organization which provoked the recent Israeli attack on Gaza by firing thousands of rockets at Israeli civilian areas, then proceeded to deliberately put Palestinians in harm's way during the recent conflagration, now wishes to control the flow of relief efforts in to Gaza. GAZA CITY (AFP) — The Hamas-run government in Gaza said on Saturday it would create a committee of senior officials to oversee all relief efforts in the territory after Israel's massive assault earlier this month. The National High Committee for Relief will be headed by Ahmed al-Kurd, the Hamas-appointed minister of social affairs, and will distribute some 35 million euros (45 million dollars) to those who lost family members or their homes. "It will be the only body to oversee and supervise the rescue. We will be in contact with all other bodies, whether local, national or international, to organise[sic] the relief," Kurd said at a Gaza City news conference. GEORGE STEPHANOPOULOS: Hello, again. In nine days he will be president of the United States. This morning Barack Obama is our exclusive headliner. Welcome back to THIS WEEK. BARACK OBAMA, PRESIDENT-ELECT: Thank you, George. STEPHANOPOULOS: Does it feel like you're president already? For the sixty years of it's existence, Israel has actively pursued peace with neighboring countries. In point of fact, it is currently negotiating a two-state solution with the Palestinian President, Mahmoud Abbas. An elected president of Gaza, removed from power in a violent coup by Hamas1 in 2007, Abbas currently governs from the West Bank. Then there is Hamas1. Funded by Iran, existing to spread a form of extremist Islam, and internationally regarded as a terrorist organization. It is fundamentally the same as Hezbollah or al Qaeda, and it is violently opposed to Israel's existence. 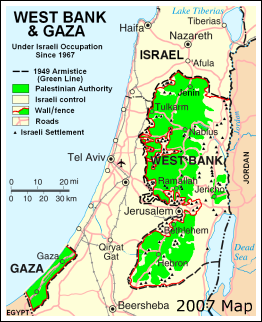 It is also violently opposed to any peace settlement which would acknowledge Israel's existence. While I feel terribly sad at the deaths of civilians (17% of the casualties in Gaza), it makes me even more sick that civilians were intentionally put in harms way by Hamas. But then, this is nothing new for this violent terrorist organization, who was duly elected by the citizens of the Gaza Strip. And, I feel just as much sympathy for civilians in Israel who have been under attack by Hamas since 1994, and over the past three years, have endured 6,000+ rocket attacks. I don't know about you, but I gotta say that I personally would have not had the patience to endure 6,000+ rocket attacks before getting down to some serious attempts to bring the perpetrators down. For those of you who have noted, and remarked on the disparity in casualties and military might, reading some history might just give you some real perspective on this matter. JAN 4 EDIT:This quote is from a German blog, Die Verwirrung im Walde, and it strikes to the heart of the matter on "proportionality". 5.1. Proportionality is not measured by the outcome but rather by the intention. 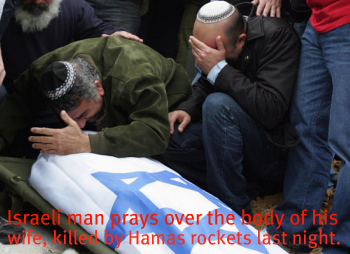 Every single rocket Hamas fires on Israel is meant to cause civilian casualties. However, Israeli air and ground attacks against Hamas are meant to cause as less damage as possible to civilians, and as much damage as possible to the terrorists. The optimal result for Israel would be 100% Palestinian militant casualties, while Hamas’ optimal result is 100% Israeli civilian casualties.